Cambridge Arts Theatre goes on fans pre-sale Monday 8th April at noon. See the listing below for how to book. The show is at the Churchill Thearte, Bromley from Monday 15th April. Fans at the Show is over 850 images now. Thanks to everyone that is sending in images, however we'd love to see even more photos of you and your friends at the show, Southampton we need you. I've update the Merchandise section with more new items for this tour. The Time Warp teeshirt, Babygrow, Drinks Bottle and Badges are now added. More items will be put onto the page as I get them. 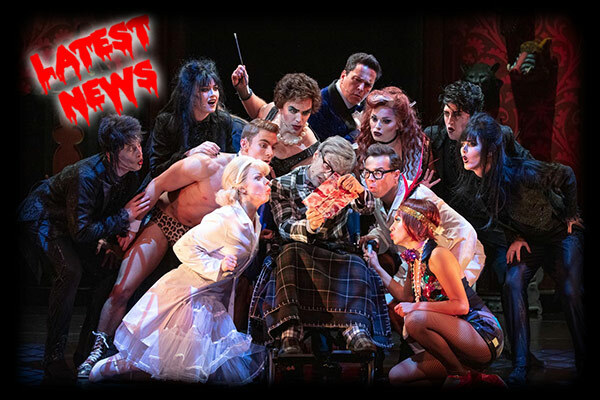 Once more, the lovely folks at Rocky Horror Company gave me permisssion to take some images of the Dress Rehearsal for the 2018/19 tour of The Rocky Horror Show and publish them here on the TimeWarp site. Fifty one images are now online. Enjoy! BOOK ONLINE On Sale now. It wouldn't be Rocky Horror if there weren't a few stocking, suspenders and basques parading the high streets of towns around the country. Sometimes the girls wear them too! We'd love you to send us your images of you and your friends at the show for publication here on the site in the original fans at the show pages. Images have to be taken after 12/12/2018. Images must not be of the show itself (that would be naughty and a good way of getting your camera taken away!) Please don't send any image over 20Mb or our email system will reject it and please make sure that you tell us who the image is of and at which venue or I'm likely to make up my own caption. You do not need to be a TimeWarp member to send your images. If you want a particular name associated as the person that sent the images please let us know otherwise we will use the first (or only) name sent on your email. RHS review - Tuesday, January 29th, 2019. RHS article - Tuesday, January 29th, 2019. Dom Joly / RHS article - Monday, January 28th, 2019. Beverley Callard story - Thursday, January 17th, 2019. Looks like a reprint? If you spot a review I've missed, please sent me a message via the feedback form and I will try and add it asap.